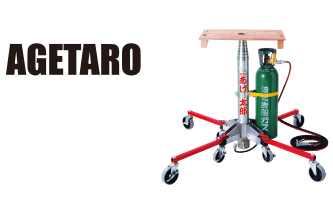 Ensures ease of use, provides a great effect within a short time, and ideally supports your work in narrow areas.The Agetaro Series is of pneumatic lifter type. Allows troublesome height work with ease. Solves a shortage in labor with an increase in working efficiency. 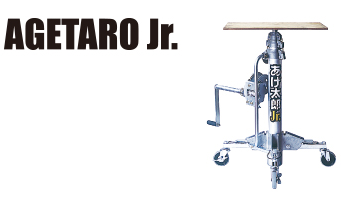 Ideal for the energy saving and laborsaving of the installation of equipment, such as air conditioners and outdoor units.The Agetaro Junior is of wire lifting type. A lifter using a telescope cylinder to wind a wire manually for lifting power. Sister machine of the Agetaro pneumatic lifter.